Karymsky (Kamchatka): Explosions at the volcano have been relatively frequent recently and often intense enough to be detected on satellite imagery, monitored by Tokyo’s VAAC (Volcanic Ash Advisory Center). Zhupanovsky (Kamchatka, Russia): Activity of the volcano has picked up again recently. Several explosions occurred during the past days at the volcano, generating ash plumes that rose to approx. 22,000 ft (7 km) altitude and drifted ESE. On a satellite image from this morning, the darker trace of ash from Zhupanovsky (and from nearby Karymsky volcano) is clearly visible on white snow covering Kamchatka at the moment. 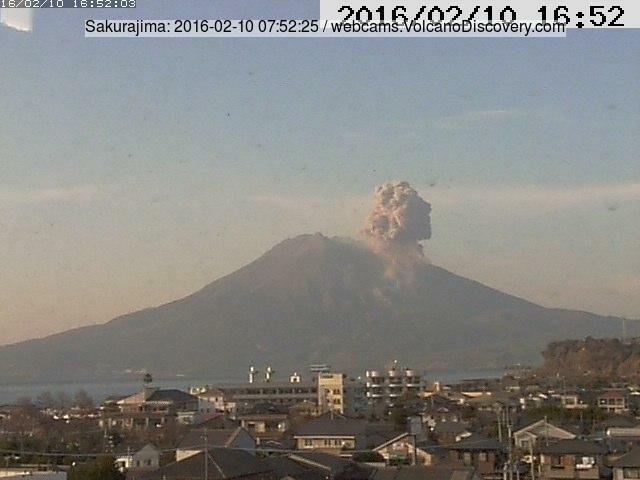 Sakurajima (Kyushu, Japan): It seems that the volcano is back to its typical activity of intermittent explosions at irregular intervals mostly ranging between few hours or even days. Following the explosion on 5 Feb, several others, mostly weaker ones, have occurred during the past days. Ash plumes recorded rose to 5-10,000 ft (1.5-3 km) altitude. JMA published a report (in Japanese) which shows that the decrease of activity which started to be noticeable last summer and led to the apparent pause in explosions Oct – Jan seems to correlate with a change in deformation. Around August, the year-long steady inflation stopped and changed to rapid deflation over a few weeks’ period. This trend stopped and inflation began again around October. A comparison of thermal images of the crater between 2 December 2015 and 6 February show elevated temperatures in the Showa crater, likely because of the presence of magma in the conduit closer to the surface. Fuego (Guatemala): A new paroxysm (the 3rd this year) is occurring at the volcano. Over the past days, strombolian and effusive activity had gradually increased into now pulsating lava fountains and well-alimented lava flows.